It may sound odd, but I’ve always found autumn to be just a little bit depressing. I do love the crisp, cool air; the beautiful colors of the turning leaves, and the pumpkins and gourds that are used to decorate our houses and yards. But even while I’m enjoying all the good things that autumn brings, I also feel an underlying sense of sadness and loss. The days are getting shorter, those beautiful leaves are going to fall to the ground and leave the trees stark and bare, and I know that cool, crisp air is soon going to be replaced by cold, snow and ice. I’m not a huge fan of winter (it should end the day after Christmas, as far as I am concerned), and so maybe the problem is that I’m just too aware that when autumn comes, winter is not far behind. But this autumn has been an exceptionally good one for me and my family, and I can honestly say that for once, I’m not melancholy or sad. Just last month, we celebrated the wedding of our daughter and our terrific new son-in-law, and that was a joyful, happy occasion for all of us. Yesterday, my son proposed to his long-time girlfriend, which means that not only do we have another wedding to look forward to, but that our family is changing and growing in a very wonderful way. Yes, being middle aged means that I am sometimes dealing with too many changes that are challenging and sad. But other times, the changes that come to me and my family are very positive, exciting and hopeful, and knowing that both of my children have found a special person to love and share their life with is a change of the very best kind. I know our family will never be the same, but in this case, that’s a good thing. Last night we gathered at a local restaurant with a small group of friends and family to celebrate the engagement of my son and his new fiancé. We were celebrating the beginning of their new life together, the joining of two families who will support them throughout their journey, and of all the possibilities that the future may bring them. It’s a good, happy and hopeful change for us all. And for me, it’s a powerful reminder that there are still lots of good things in life to come, no matter what the season. Good for you. I admit, leaving the cold has not been a problem, so I hear you there. A friend sent me a video of it snowing today! Better him than me!! Ha ha. Oh, I agree! It is way too early for snow…..
Another wedding! Congratulations. Now that you have one under your belt, this one should be a breeze. You can look forward to grandchildren in the future. I feel the same way about summer ending and get a little melancholy. There is nothing I enjoy about winter unless I am inside a warm room looking out at it. I just love the popcorn and saying. What a great idea! Actually, the popcorn bags and saying were my daughter’s idea. She’s very good at that sort of thing…I just help her, but she comes up with the ideas! And yes, I’m thinking this wedding, as mother of the groom, will be much easier. I’m really looking forward to it! Thanks for the comment! I’ll probably wear blue rather than brown, but otherwise, I’ll be the usual mother of the groom, I think. And did you recognize your quote? I didn’t get it word for word, but it’s what you said in one of the comments to my blog, and it stuck with me. You really do have a way with words! Thank you for that! Blue or brown, it’ll all work out…:) Yes I did recognize the words, thank you…. :) And thank you for the compliment. I appreciate your kindness. Congratulations Ann! Another exciting wedding to plan and look forward to! So happy for you! Thank you Jodi!! We are excited! What great news! I don’t know why, but I keep thinking Daniel is 22. The years do go by, and now he’s engaged. I love fall. It’s my favorite time of year. I think because I associated it with change and the prospect of something better as each year passed by in school. Autumn still holds that sense of promise for me. I also love sleeping. I love getting into bed and getting all snuggled up under the covers, turning on the TV, and then setting the sleep timer so it won’t be on all night. Lately, I’ve been thinking of fall and winter as nature going to sleep. So, I decided to look at fall as getting into bed and winter as the sleep. I wish I looked at fall that way! But it has always struck me as more of an ending than a beginning. I like spring the best, even with the pesky pollen I’m allergic to. I just love seeing the flowers beginning to bloom, the trees budding out, and knowing warmer weather has finally arrived! Thanks for commenting…I miss you! Congratulations to your family, Ann! Love the popcorn bags! Adorable. Thanks, Kim! 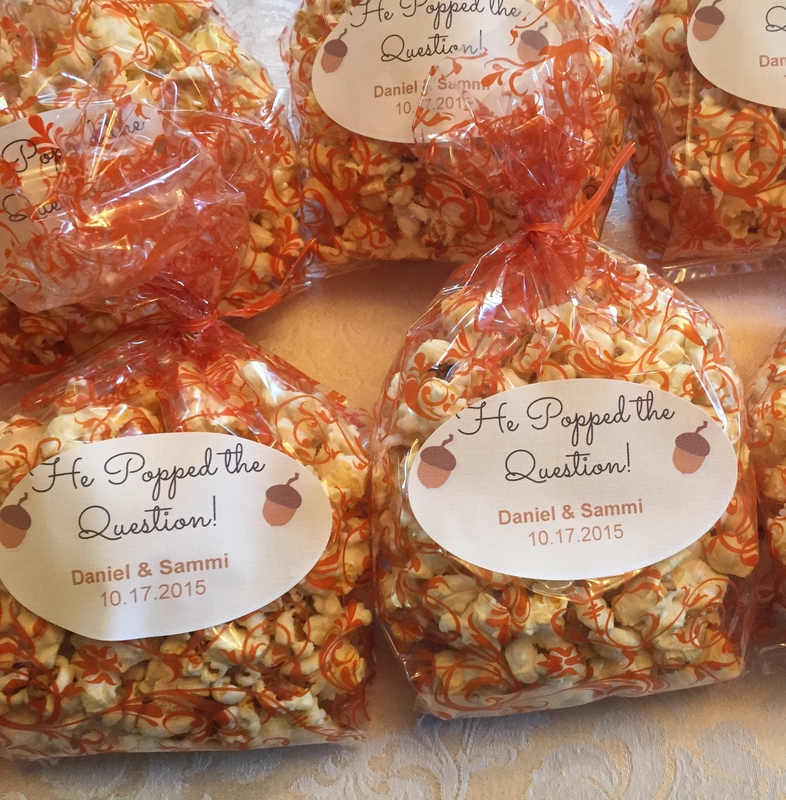 The popcorn bags were my daughter’s idea, but I thought they were cute! Thank you! And no worries, I take my wedding cake very seriously, too! At my daughter’s wedding, we had both vanilla cake with raspberry filling, and chocolate cake with marshmallow vanilla filling. So I have high hopes for good cake at my son’s wedding…. Thank you! We are excited for my son and his fiancé! And you are so right, there are still lots of things to look forward to, we just need to be reminded every once in a while. But I’m not looking forward to the cold, either!! That’s such great news! Your family is expanding and there will be more happiness now! Yes, we are very happy and excited! So glad to find a fellow blogger that sounds a lot like me…same age group, same thoughts & feelings, doesn’t like winter, etc. I will be enjoying your blog!